The NHS Newborn Hearing Screening Programme (NHSP) has played a major role in identifying moderate and profound hearing loss in newborn babies. Before the introduction of the NHSP, half of the children with moderate and profound hearing loss were not identified until they were 18 months old and a quarter not identified by three and a half years of age. Since being implemented across England, the screening programme has helped to reduce the age at diagnosis of a hearing loss to an average of 60 days and the age at which a baby gets fitted with a hearing aid to 90 days. Early identification of hearing impairment gives children a better chance of developing speech, language and communication skills. Without screening it is hard to identify the one to two babies in every 1,000 who are born with a hearing loss. 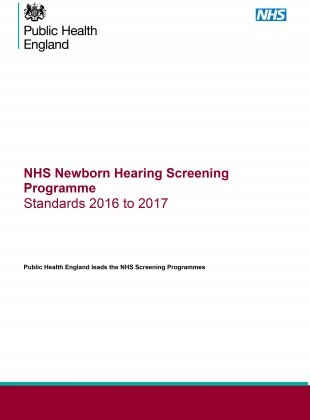 We have published, following consultation, revised national standards (above) to help support health professionals and commissioners in providing a high quality newborn hearing screening programme, with an implementation date of April 2016. These standards replace the previous Quality Standards in the NHS Newborn Hearing Screening Programme- July 2010. The 5 new and revised standards, listed below, provide a defined set of measures to ensure local programmes are safe and effective. These standards cover the screening journey up to and including the point of referral to audiology and entry into audiological assessment. Standards 1 and 5 are the current NHSP key performance indicators (NH1 and NH2). For Standard 1 (NH1), the acceptable threshold has been increased from 95% or more to 97% or more. For Standard 5 (NH2), the achievable threshold has been changed from 100% to 95 % or more. Standards 2 and 3 have different thresholds for community and hospital programmes to reflect the differences in the age at which a baby is typically screened. The standards should be introduced by screening providers from 1 April 2016. In conjunction with the revised standards, the national programme is refining the monthly and quarterly data reports it produces to help services monitor programme performance more effectively. Further information will be shared in due course. Public Health England (PHE) does not have a remit to set standards for paediatric audiology, medical or early intervention services, so these have not been included in the revised standards. However, PHE is working closely with NHS England to ensure the previous programme standards relating to diagnostic and early intervention services are transitioned to the appropriate body. And we are maintaining an archive copy of them on GOV.UK alongside the revised 2016 standards.